If you currently use your main phone number for everything under the sun, you might have noticed that those annoying telemarketing calls have started appearing on your cell phone. If you have a home phone, you will be bombarded with marketing calls no matter what, but cell phones have been mostly immune to this problem until recently. Unfortunately, if you use your main phone number when signing up on Craigslist or Airbnb or when applying for a credit card, the number may eventually find its way to these telemarketing companies. Luckily, you can add a second phone number to your current phone that you can use anytime you don’t want to share your main number. In this article, I’m going to talk about several apps that basically add a second line to your phone. The prices range from free to close to $10 a month. The more money you’re willing to spend, the more features you’ll get. The paid options are mostly for freelancers or people who run small businesses from home. There are basically only five recommendations I have for apps: Google Hangouts, Sideline, Burner, Skype and Line 2. In terms of cost, Google Hangouts is free, Sideline is $3 a month, Burner is $5 a month, Line 2 is $10 a month and Skype varies depending on the number. In my opinion, you should start with free first and go from there until you find the app that works best for you. If you’re not running a business of any kind, then Hangouts will probably be more than enough for most people. 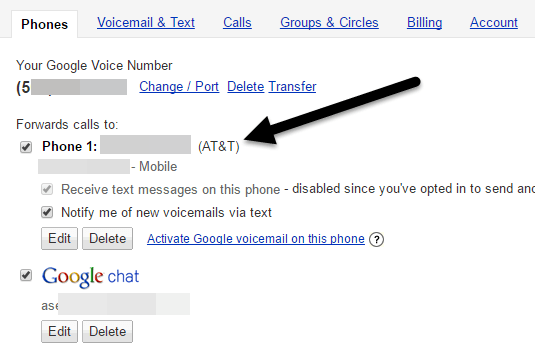 To be clear, you actually create a Google Voice number and then use Hangouts to make calls and send SMS messages. The first thing to do is go to Google Voice and get it connected to your main number. Once you have done that, click on the gear icon at the right and choose Settings. 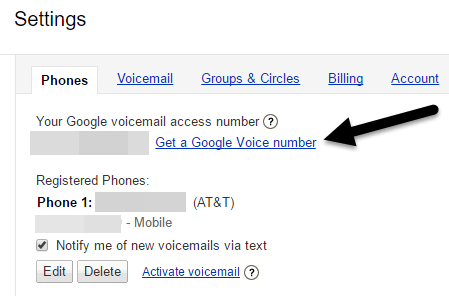 You should see an access number for your voicemail and next to that, you will see a Get a Google Voice number link. When you click on the link, you’ll have to choose whether you want a new number or if you want to use your mobile number. Obviously, if you want a second number, choose I want a new number. On the next screen, you can get a number by area, zip code or city and enter a word or phrase or number if you want something specific. Keep going until you have your new number setup. 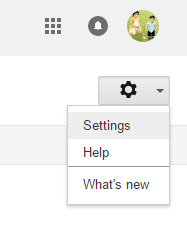 When someone calls on your Google Voice number, it will ring in Google Hangouts by default. 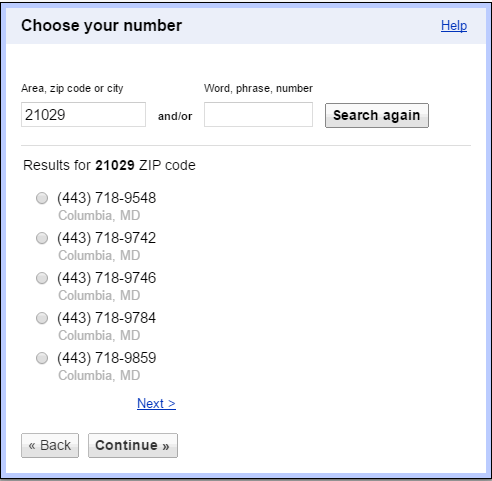 However, you can go into the settings page on Google Voice and have the calls forwarded to your main number if you like. This way the phone will ring like a normal call. In addition, you can record your own voicemail greeting and your name. You can forward text messages and voicemail to your email also. 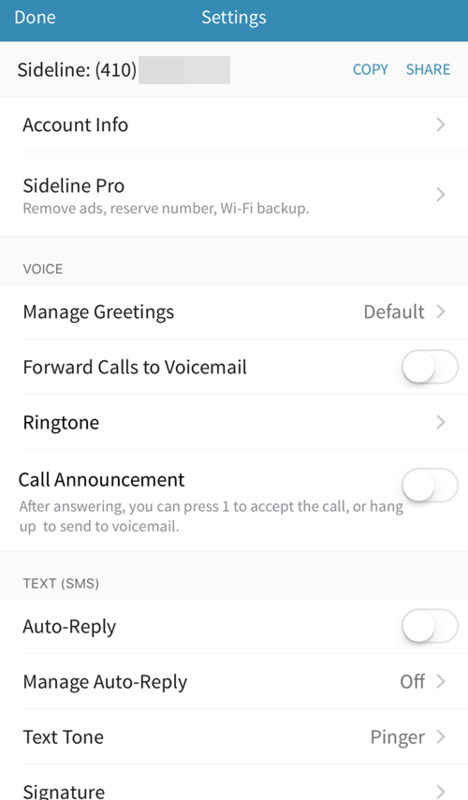 On the Calls tab, you can setup call screening so that unknown callers will have to speak their name before being connected to you. Google Voice also lets you record calls, switch between calls and do conference calls. The great thing about Hangouts is that it works on several platforms including iOS, Android, and Chrome. If you go to https://hangouts.google.com/, you can send text messages and make audio and video calls from the web. Another nice advantage to Google Voice is that you can still receive calls on your phone even without Hangouts being installed. The only downside that I have run into so far is that sometimes the number is not accepted on certain websites, especially for use in two factor authentication. Most of the time it works, but sometimes you’ll get a message stating you can’t use that number, in which case you’ll have to use your real number. However, this issue isn’t just limited to Hangouts, but occurs will all second number apps. As with all other apps, except Sideline, Hangouts is a VOIP app, meaning it uses data in order to work. If you don’t have a large data plan and you’re not connected to WiFi, this could cause problems for some users. Sideline is the only app that uses your carrier network to make and receive calls, thereby reducing data usage. However, it uses your cellular minutes just like when you are making calls from your carrier number. For $3 a month, Sideline gives you a second local number with less features than Google Hangouts. You can create a custom voicemail greeting, but that’s about it. By default, the app has ads, which is annoying. In order to remove the ads, keep the number permanently and enable WiFi calling, you have to spend the $3 a month. But even with those features, it still doesn’t offer anything on par with Google Hangouts. For example, when receiving a call to your new second number, it shows some generic number in Sunnyvale, CA rather than the number of the actual person calling. You have to open the Sideline app to see the actual number of the caller. Texting is free and there doesn’t seem to be any limit. If your cell phone plan allows you to call anyone at any time, then you can use your Sideline number similarly. You’ll also be able to port your number out eventually with the $3 a month plan. The Burner app’s purpose is slightly different than all the other apps mentioned here. For one thing, the numbers are supposed to “burn” away after a set amount of time. You can get a premium line, which is the $5 monthly fee I mentioned above, with unlimited texts, pictures and minutes. Otherwise, you can choose from a wide variety of burners, like the Mini Burner, which will give you 60 texts, no pics, 20 minutes calling and auto-burns in 14 days. You can check out all the different types of burners here. In order to buy the burners, you have to use credits. You can purchase credits inside the app. 3 credits are $2, 8 for $5, 15 for $8 and 25 for $11. This is a great app if you need new numbers often. 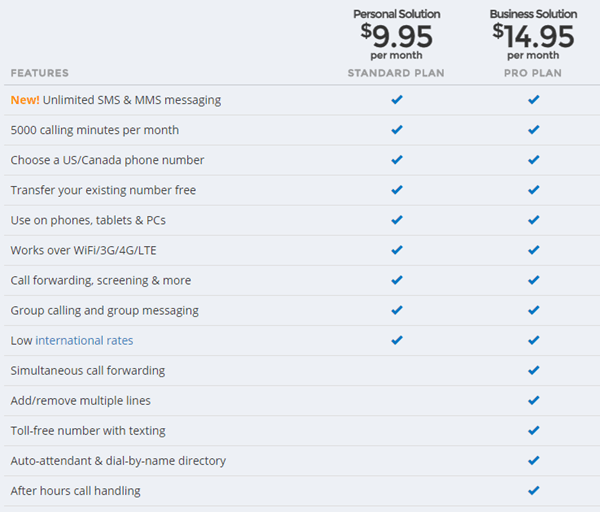 If you just want a single number for a long period of time, get the Premium line for $5 a month. One interesting feature of Burner are integrations or connections to other apps. For example, you can connect to Evernote and create a SMS auto-reply bot. Doesn’t make sense? Check out the video. It’s actually pretty cool and could be very useful for some people. In addition, you can log text messages to Google Sheets or save voicemail to Dropbox. The app doesn’t have very many features, but works well. You can also set your own voicemail greeting for each burner number you create. Next, there is Line 2, which is definitely geared towards freelancers and business owners. I’ve used Line 2 in the past for my local computer repair business and it was definitely worth the price. They have a personal version for $10 a month and a business version for $15 a month. You can see the difference between the two services right on the home page. For a real business, the auto-attendant, toll-free number, multiple lines and after hours call handing features are a big plus. Obviously, it’s a lot more expensive and not something I would recommend unless you are trying to run a business out of your home, etc. Line 2 also has an excellent app and web dashboard for managing all your calls, voicemails, forwarding rules, etc. It’s a bit expensive, but the cheapest option for a business that needs some extra features. If you already use Skype, you may want to check out getting a Skype Number. The cool thing about Skype is that you can get International numbers also. Pretty much all the other apps above work only with U.S. and Canada numbers. The cost for a number in the US is around $6 a month. Along with the Skype number, you get all the benefits of using Skype like video calls, group video calls, SMS messaging, screen sharing and file sharing. With Skype, you basically buy credit that you can use for international calls, international SMS, etc. Overall, it’s really easy to get a second or third or fourth number for your phone without much work. There are a lot of options out there and the best one for you will depend on your usage scenario. The great thing is that you can cancel all of these services whenever you want if you’re not satisfied. If you have any questions, feel free to comment. Enjoy!